Claudio Grass: "We Cannot Fight a Debt Crisis by Piling Up More Debt"
You’d think it would be obvious, self-evident. That continuing to do what we’ve done, let alone accelerating that process, is not the solution to shoring up the integrity of our currency system. But the federal government is run by people who only care about getting reelected, and when all is said and done, they will make impossible promises and vote for additional, unpayable debt if it means getting more votes. Which, sadly, it does. The fall of the US dollar and the rise of gold will be synchronous. Don’t wait for the former to invest in the latter. The Chinese are starting to trade in renminbi backed by gold; at the same time they're planning BRICS trading based on gold. And I think it just shows that gold is becoming part of the system again, and that the East is trying to diversify their risks when it comes to fiat money into gold, which basically is insurance against all the risks which are linked with our current fake monetary system. We used to live under the American empire which basically took over after the Second World War; during the last 60 years it has basically just piled up a gigantic amount of debt. 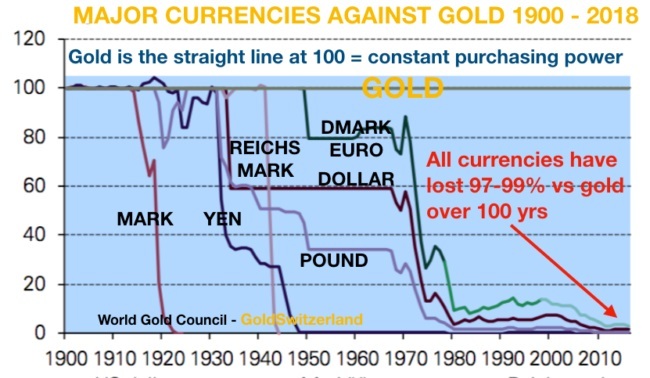 The world currency itself has always been the US dollar; even today, roughly sixty percent of all the reserves of the central banks are held in US dollars. At the same time, when it comes to international trade, the US dollar is the dominant currency. We are at the end of a long-term debt cycle. Everything operates in cycles. We have printed money out of thin air, created it out of nothing for almost 50 years, basically since Nixon went off the gold standard. Since then, the US dollar has been the predominant currency. But everything comes to an end. We cannot fight a debt crisis by piling up more debt, and I think all the currency wars we have seen over the last ten years are signs that the world is changing, and that the world that we know is basically falling apart.